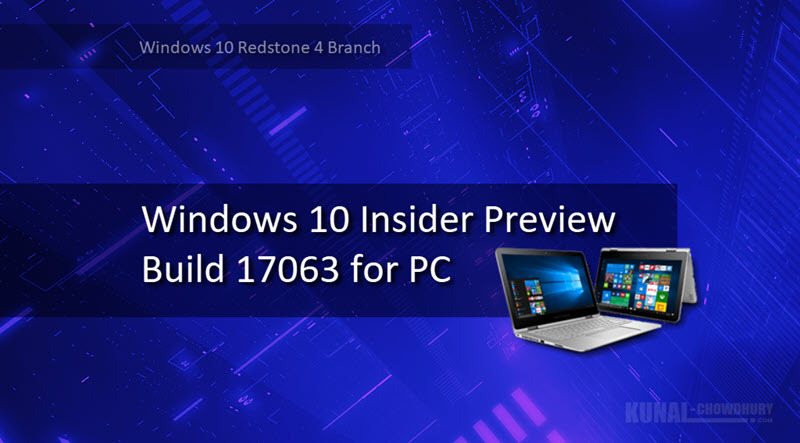 After almost a month of wait, Windows team has released a new build 17063 to the insiders in the fast ring. If you are in the fast ring, you won't want to miss this build as it contains a large no. of new changes, improvements and fixes to Windows 10. Check out this post to know more about the key changes part of this build. Don't forget to read the original release notes, known issues in this build. What’s new in Windows 10 Insider Preview Build 17063? Here's the key improvements in this new Windows 10 preview build 17063, which you would like to explore. It also contains other changes, improvements and fixes. Do check out the original blog post to read them. Windows 10 insider build 17063 introduces 'Windows Timeline', which will allow you to resume your past activity where you left off. Either that was on this PC, other Windows PCs, and iOS/Android devices. It also allows you to see all the activities that happened in a single day, and if you can’t find the activity you’re looking for in the default view, you can easily search for it. The new activity history settings page allows you to control which accounts appear in Timeline. This is most relevant for users with multiple accounts. From the same page, you can disable and/or clear the activity history from your system. 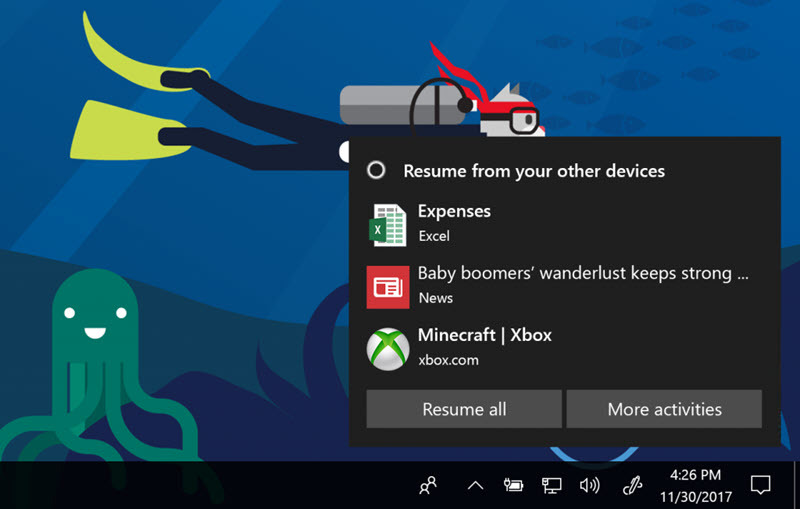 Cortana can now suggest activities you might want to resume to help you stay productive as you switch between your phone, laptop and other Cortana enabled devices. This experience is powered by the same activities that appear in Timeline. 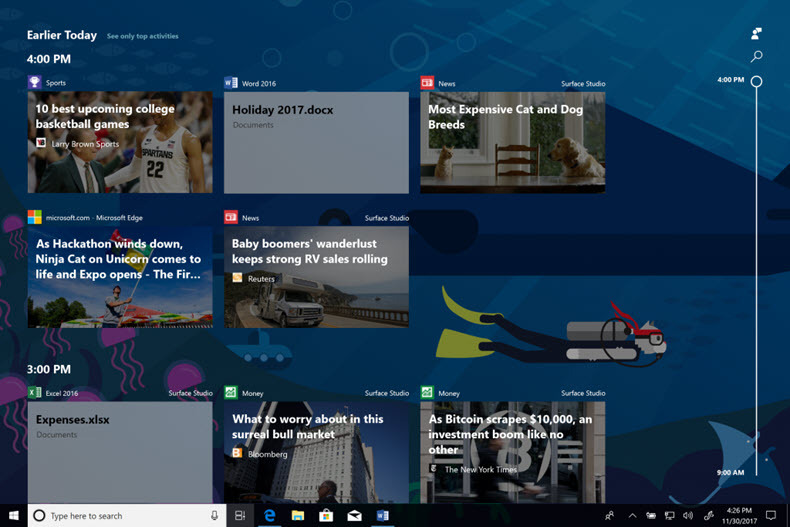 Cortana's Notebook has undergone a UX transformation to be more responsive to Cortana’s evolving capabilities and allow users to easily complete their tasks. It now has a new home called Organizer that lets you access your lists and reminders with ease. Cortana Collections have been merged with Lists, so you get personalized suggestions and help with List creation – all in a rich, attractive interface. Cortana helps you track your To-Do’s and manage Grocery lists. She also suggests items of interest – restaurants to try out, recipes to make, books to read, movies & shows to watch, things to shop for, and more. You can now use Cortana to control music playback on more of your favorite music apps. Fluent design updates have been included in Microsoft Edge. It now supports an updated Dark theme, and much better contrast with all colors, text, and icons. With this build, Microsoft Edge has also simplified adding and managing bookmarks for EPUB and PDF books. This now allows you to add bookmarks and manage your list of bookmarks from the same location. Microsoft Edge now supports Service Workers and the Push and Cache APIs. These new web standards allow web pages to send push notifications to your Action Center or refresh data in the background, even when the browser is closed. This build installs the Web Media Extensions package for Microsoft Edge, which extends Microsoft Edge and Windows 10 to support open-source formats commonly found on the web. This build introduces a new gesture experience for Precision Touch Pads. You can now use gestures like pinch and zoom, or two-finger panning, to achieve the same interactions on web sites that you can do with a touch screen today. In an effort to further keep you informed about the state of your OneDrive files and folders on demand, Microsoft added a state icon to use in File Explorer’s Navigation Pane. Microsoft updated the network flyout on the login screen to use the same familiar network flyout you’ve grown to love in the taskbar. With this build, if Windows Update Settings shows a warning or alert, we will now echo that via a new Windows Update system tray icon. If you right click the icon, you will see options relevant to the current state. Wait! That's not the complete list of new enhancements in this build. There exists a lot more for you to explore. It consists of changes to My People experience, changes to Snipping Tool, Windows 10 Settings Page, Toast Notifications about blurry apps, Keyboard Settings, Data Usage Management, Windows Defender Improvements and more. Don't forget to check out the entire list in the original 'Release Notes', shared by Microsoft on their official blog page. This build also includes a bunch of general changes, improvements, and fixes for PC. As it is from the developer branch, it also contains few known issues. Don't forget to check them too before downloading this new build. It's not require to mention that it's definitely a great build with more new things to explore. Hat's-Off to the Windows Team!!! If you have come this far, it means that you liked what you are reading ( Windows 10 Insider Preview Build 17063 is now available with bunch of new changes and fixes).